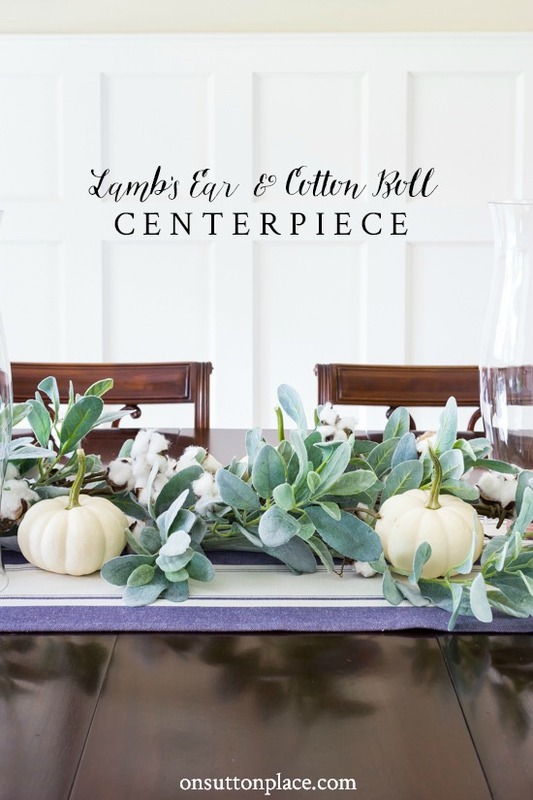 This lambs ear garland centerpiece idea is perfect for your fall table decor. 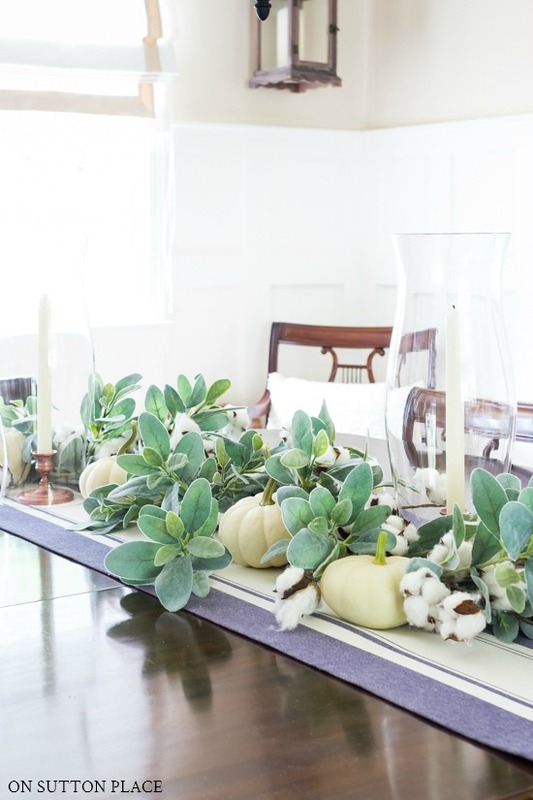 Fluffy lambs ear & cotton bolls add texture and interest to any autumn table! 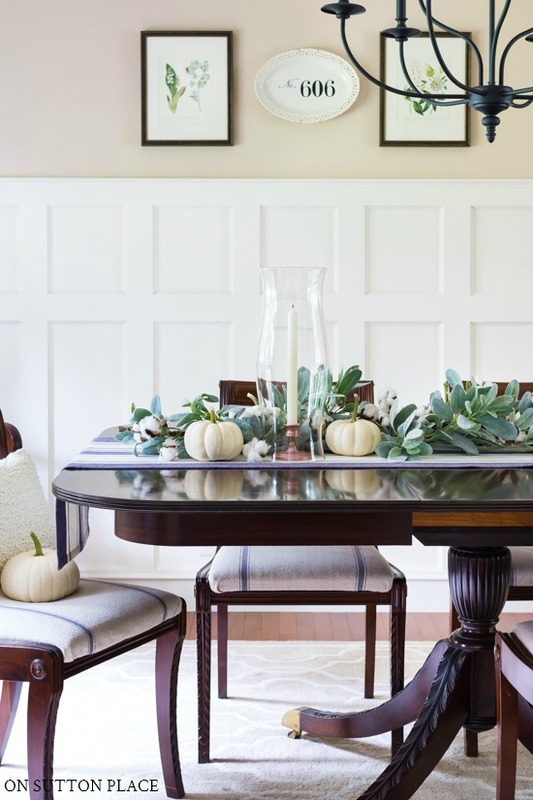 When it comes to seasonal decor, I have a few favorite places to decorate. Number one is, of course, our front porch. Number two is my dining room table. Even though we don’t use the dining room all that often, I have a direct view from my kitchen, so I really do enjoy whatever centerpiece is there. This lambs ear garland centerpiece idea is loosely based on the eucalyptus garland I made last year. The process is a bit different since I used faux lambs ear and the eucalyptus was fresh. Putting together this lambs ear garland is really quick and easy. Gather your lambs ear, cotton boll garland or stems, and some short pieces of florist wire. The florist wire pieces should be around 5 inches long. I stood at my dining room table so I could better guage the length of the garland. One by one, I wired the lambs ear stems together, making a long row. The stems will overlap, but don’t overlap the lambs ear. When the garland is finished, place it in the center of your table. Nestle the cotton boll garland in and around the leaves. Tuck and fluff until you like the way it looks from both sides of the table. If you are using candlesticks or hurricanes, place them now. The last thing is to add some mini pumpkins on both sides of the garland. Stagger them so they are not in a straight row. 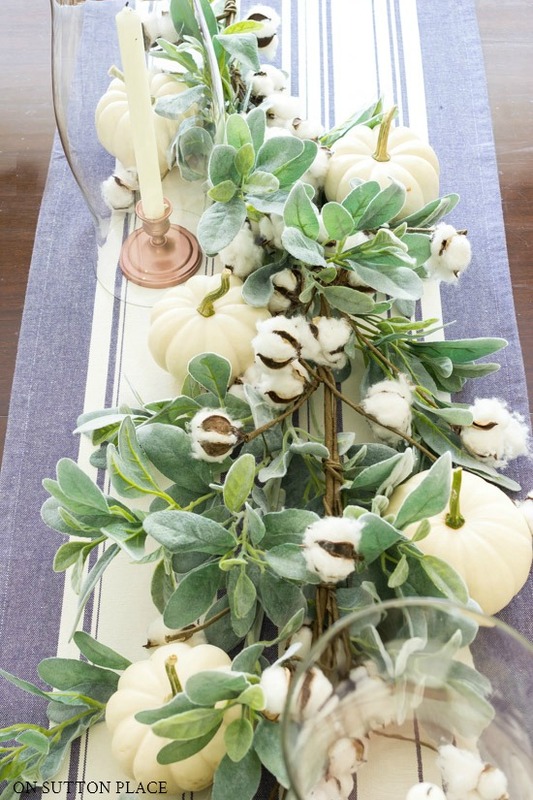 If you can’t find a cottonboll garland, just use cotton boll stems. You can either nestle them into the greenery and let them be, or you can wire them in. This centerpiece idea can be made with any kind of greenery. If you have something on hand, give it a try. Also, the greenery doesn’t have to match. Mixing greenery stems would add just as much interest and texture. Substitution ideas for the cotton bolls: Sunflowers, mums, gold or orange berries, mini faux gourds. I want to say thank you to those of you who make it to the end of my posts. I know your lives are busy, and I don’t take the fact that you’re here for granted. Each one of you is important to me…I haven’t told you that in a while, so I just wanted to make sure you all knew. See you soon! I’d love for you to subscribe to receive my email updates by joining the OSP community. Waiting for you is a Members Only Library full of printables. Included is DIY wall art, gift tags, banners, eBooks, guides, eCookbooks, and more. Ann, you are one of my top two favorite blogs. I seldom write a comment, but I thoroughly enjoy your posts. Love your posts and ideas!!! You are so talented and I have copied so many of your ideas. I too can see my dining room table from my kitchen so one of my favorite places to decorate. You have a warm and beautiful home. I love this! And by the way, I am one of those folks who rarely comments but, I read every word of each post. I wouldn’t want to miss a word of inspiration! Thank you so much for taking the time to say hello! You have the best taste in decorating that I have seen. I love the seasonal decorations because they are both beautiful and easy to replicate. I am all for decorating but want to be able to do it without stressing how it will look when I have finished it. I love your porch decorations. Your neighbours must be envious of your seasonal creations. Wow! That is just beautiful. Love it so much. You could have fooled me on the lambs ears! They looked so real. Very pretty. Oh, lawd! We are on the same wavelength! I’m working on a cotton boll and lambs ear mantel! But I didn’t think to do the same on the dining room table! We are blessed to have our children and grandchildren living near us. We know it won’t always be that way as two of our grandsons have already graduated from college and our granddaughter is getting close. We use our dining room every Friday for family night. All who can, eat dinner with us. I love my dining room table decorated but sometimes it’s a hassle to remove the decorations. But I’ll keep decorating anyway.😀 Yours is beautiful. You always make it sound so easy. Ann, I love the garland table decoration. Unfortunately, with my grandkids being at my home several times a week and on Saturday sometimes having all five of them, my dining table is always cluttered with school bags, books and whatever! I tend to keep my decorations on a tray that can be removed when needed. I do get to decorate my island in the kitchen and that too is on a tray of some sort for easy removal when the kids want to eat, bake or just a place to draw and play games. Someday I will not hear the chatter and have all the paraphernalia that comes with them so I am enjoying while it lasts! You always have such lovely things to show us! Thank you! If I had to choose between a pretty centerpiece and my grandkids around the table…the grandkids would win every single time. Love your idea of using a tray! Love the lambs ear, it looks beautiful on your table, simple with a bit of rustic farm house. What a nice thing to say…thank you so much! This would work great on a sideboard…and you only have to worry about one side! Thank you so much for your kind words…happy fall! Your centerpiece is just perfect for that table. There has yet to be a decorating idea from you that I did not like. 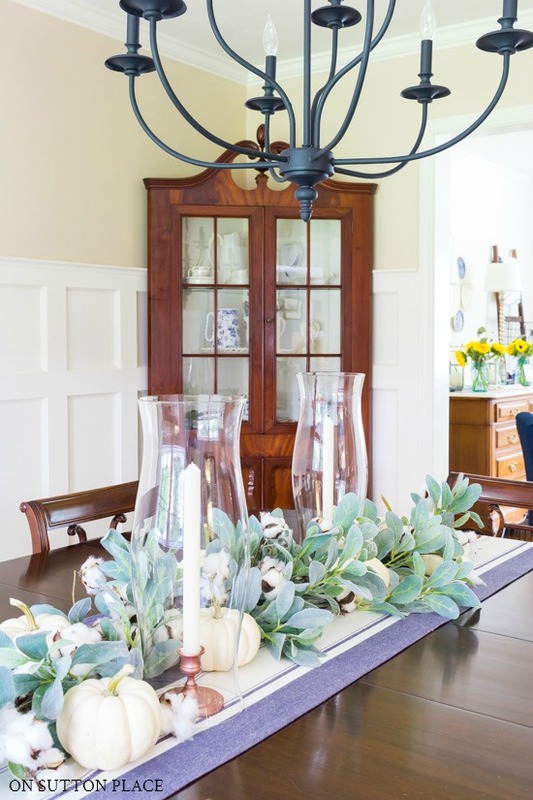 Although I do not have a formal dining room I do use a centerpiece on our kitchen table and will modify yours to work this area. I love how you intertwined the garland lambs ear is one is one of my favorites. Always look fresh. And it pairs with so many different things. I am always inspire d.
Ann, this is lovely. Lambs Ear is one of my favorites.